We’d love your help. Let us know what’s wrong with this preview of The World from Up Here by Cecilia Galante. But that all chang From the award-winning author of The Patron Saint of Butterflies comes a story about the courage it takes to face your biggest fears. To ask other readers questions about The World from Up Here, please sign up. Emma Dixon The actual story part is 305 pages long, but all together, credits and everything 309 pages. "The World From Up Here" is a touching story, following Wren and her younger brother as they deal with being displaced to live with their aunt and cousin (who they barely know) while their mother and father are away, dealing with their mother's depressive breakdown. Loved: While this wasn't THE trajectory of the story, I loved how timid Wren dealt with her autistic brother throughout the book. Watching her struggle with frustration, fear, and love while fielding her brother's outbur 3.5, I think. Loved: While this wasn't THE trajectory of the story, I loved how timid Wren dealt with her autistic brother throughout the book. Watching her struggle with frustration, fear, and love while fielding her brother's outbursts, needs, and reactions felt so real and true. Liked: I enjoyed the growing bonds between Silver and Wren. I liked how Silver prodded Wren out of her shell, without being obnoxious about it, and had reasons to admire Wren as well. Silver's mother, the aunt, was wonderful in being gentle and supportive of her niece and nephew. I liked how the Witch Weatherly issue resolved, and how overall Wren managed to be a strong character despite (or maybe including) her fearfulness. I realize these are things that happen in the real world. But I think when representing depression and mental illness in a parent to children in a book, I really believe it should be done in a way to help kids understand it. Not make it super vague, scary, and something that takes mom and dad far away and unreachable in another friggin state. It kind of seemed like the author needed a reason to remove them, and so went with that. Oh, I really loved this book! The characters of Wren and Silver jumped into my heart. I loved seeing the character development in Wren. Great story about being brave. Wren Baker, who is inclined to worry, finds herself reeling after her mom checks in to a psychiatric facility to cope with her depression and Wren moves in temporarily with her aunt and beautiful cousin Silver. Because Silver is so popular at school, Wren is suddenly inundated with questions about their relationship, and with her parents both at the hospital all the time, she is also left to worry about the behavior of her younger brother, who has autism. When Silver decides she wants to study l Wren Baker, who is inclined to worry, finds herself reeling after her mom checks in to a psychiatric facility to cope with her depression and Wren moves in temporarily with her aunt and beautiful cousin Silver. Because Silver is so popular at school, Wren is suddenly inundated with questions about their relationship, and with her parents both at the hospital all the time, she is also left to worry about the behavior of her younger brother, who has autism. When Silver decides she wants to study local legend Witch Weatherly for a school project, Wren is nervous for her, but can't help but join in anyway. What she learns, in the end, is not just interesting, but emotionally healing for herself and her family. This book has stuck with me very strongly. The subject matter is not the most uplifting, and the effects of Wren's mother's mental illness on Wren's own well-being are troubling and sad, but there is so much hope in the novel, it is impossible not to become invested in the characters early on. The friendship that grows between Wren and Silver is one of my favorite female friendships in contemporary children's literature, and it will resonate with many girls who have found a kindred spirit in an unlikely person. For any child whose family is going through a time where a parent is institutionalized, this book will be a lifeline, but even for those for whom the subject matter is not a concern, the novel will still be an emotionally compelling read and a valuable lesson in learning to stand on one's own and choose one's own path. In the story, a girl has to stay with her cousin for a time when her mother is hospitalized. Her cousin is a little flighty and fearless, and the town has a big story about a witch who lives up I like when books can surprise you. While The World From Up Here rightfully gets praise for its handling of a character with Asperger's, the impressive feat is how it dances with the stories we all tell and the way ideas and concepts spread regardless of evidence, both in our own families and in our town. Likeable characters, a great sister-brother dynamic, and a mystery revolving around a witch. Perfect ingredients for a great middle grade read that touches on friendship, family, and even mental illness. Yet what stood out for me was its exploration of fear. Why are we afraid of the things we are afraid of? Can knowing why make it any easier to overcome a fear? And if your fears have come to govern every aspect of your life, how do you even begin to break that cycle? Give this one to readers who Likeable characters, a great sister-brother dynamic, and a mystery revolving around a witch. Perfect ingredients for a great middle grade read that touches on friendship, family, and even mental illness. Yet what stood out for me was its exploration of fear. Why are we afraid of the things we are afraid of? Can knowing why make it any easier to overcome a fear? And if your fears have come to govern every aspect of your life, how do you even begin to break that cycle? Give this one to readers who like books like "Rules" by Cynthia Lord, "Umbrella Summer" by Lisa Graff, or "Nest" by Esther Ehrlich. Wholesome, easy read about a fearful young girl and three pivotal weeks in her young life. Wren Baker is a character I would have felt much akin to at that age. She is timid and self-conscious; her greatest desire is to become brave. When her depressed mother suffers a nervous breakdown Wren and her younger brother move in with their free-spirited cousin and aunt. A school history project and her cousin Silver's spunky attitude shake things up for Wren and force her to change in ways she never c Wholesome, easy read about a fearful young girl and three pivotal weeks in her young life. Wren Baker is a character I would have felt much akin to at that age. She is timid and self-conscious; her greatest desire is to become brave. When her depressed mother suffers a nervous breakdown Wren and her younger brother move in with their free-spirited cousin and aunt. A school history project and her cousin Silver's spunky attitude shake things up for Wren and force her to change in ways she never considered possible. Hi I am 10 and I really enjoyed this book please make more like this or make a part 2 of it please I loved this book I just finished reading and I feel like something's missing. You could also do more books with Silver, Mama, Daddy, wren, Russell, Aunt Marianne, and of course Jackson, Manchester, and Roo! Please consider this! Well, for starters, I didn't like the book ... I LOVED the book! When Wren conquered her fears (riding horses, going on planes, climbing Creeper Mountain, thunder storms, and many more) I felt so ... fearless. Like I could conquer anything, too. I also felt ... proud of Wren, I guess. And it makes me feel happy when I feel fearless. This middle grade fiction story about Wren and her family is complicated and sad. There are themes of depression, bullying, family dysfunction, starting over, Asperger's syndrome-it's a lot. But it's a nice story with characters I liked. Rumor has it that in Sudbury, Pennsylvania, the depraved and belligerent Witch Weatherly resides on the peak of Creeper Mountain. What was once a majestic mountain with shimmering waterfalls is now bewitched and guarded by Witch Weatherly’s infamous red raven. If you asked a resident of Sudbury about Creeper Mountain, they would mention deadly bites from hornet-head snakes, mysterious pits where one could fall to their death, and many more horrid tales. Wren Baker is a shy and timorous sixth gra Rumor has it that in Sudbury, Pennsylvania, the depraved and belligerent Witch Weatherly resides on the peak of Creeper Mountain. What was once a majestic mountain with shimmering waterfalls is now bewitched and guarded by Witch Weatherly’s infamous red raven. If you asked a resident of Sudbury about Creeper Mountain, they would mention deadly bites from hornet-head snakes, mysterious pits where one could fall to their death, and many more horrid tales. Wren Baker is a shy and timorous sixth grader who isn’t really sure of what she is afraid of. Wren has heard enough to find it incredulous that her 12-year-old cousin, Silver Jones, wants to try interviewing Witch Weatherly for their upcoming history project. Meanwhile, Wren has enough obstacles to overcome that are much closer to home. Wren’s brother, Russell, struggles with Asperger’s syndrome. Russell finds it hard to control his short and mercurial temper at times, making him different from the others. On top of that, Wren’s mom is suddenly admitted to the hospital due to the depression she has struggled with for years. When Wren’s father leaves to accompany his wife at the hospital, Wren and her brother must stay with their Aunt Marianne and their cousin Silver. On the contrary to Wren, Silver is plucky, pretty, and popular. Stuck with relatives she has only just met, Wren is desperate for answers, as her father tells her little about her mother’s recovery. However, Wren’s perception of taking risks begins to change during her stay at Silver’s house. As Wren and Silver unravel some riveting and consternating mysteries about Wren’s mom and Aunt Marianne’s past, Wren realizes that journeying up to Creeper Mountain with Silver for their history project is the only way to learn the full truth about her mom. Is Wren ready to face Creeper Mountain’s malign reputation without the knowledge of her aunt? I gave this book five stars because of the thrilling revelations in the plot of the book, which filled me with vast excitement and a desire to know more. Wren is also a very relatable character, so I could connect with the story on a personal level. Wren shows the importance of perseverance, self-belief, and not trusting anything at the surface, like how she stopped believing in her mother’s fear of horses and tried to ride a pony. 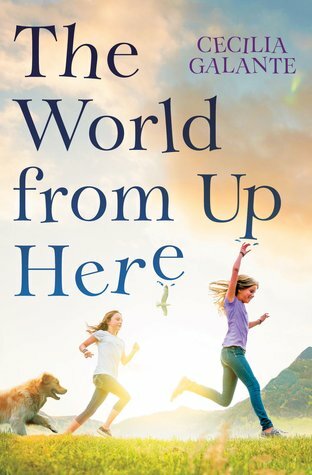 I recommend The World From Up Here to anyone who likes reading thrilling middle-grade novels packed with mysteries and well-rounded characters at every twist and turn of the plot. I felt that this book should not be judged by its genre. It is way more than a realistic fiction book. Cecilia Galante has weaved elements of fantasy, adventure, and mystery, which makes The World From Up Here an enticing read. This book had a really great story for my daughter and I to enjoy. She really enjoyed learning about Wren and Silver. Finding a friendship like that is something every girl dreams of having. I liked this story because it is a good reminder for all of us get out of our own heads and don't stress over everything. It was a story about a girl who is afraid of many things, and ends up having to live with a cousin she barely knows while her mom gets checked into a hospital. This is a good book for 10 year old girls. I really like this book. When I first saw it, I wasn't sure if it would be very good. However once I got to around page 30, I couldn't put it down! I really think this book is good for all readers that like adventure books. While getting to know one another after family circumstances pushed them together, Wren and Silver learn a great deal about each other and themselves. This book really portrays making the choice to be brave. An excellent portrayal of anxiety in children while still being a great mix of family story, friendship, and being brave. Despite being categorized as a YA novel there are ideas in this book even adults can learn from. Excellent plot and the characters were well developed. Best book ever! Took me a low amount of time to read because it was so entertaining! Recommendations and comments: There is so much going on in this book. We’ve got the main character Wren, dealing with her own personal anxiety issues. We’ve got Wren’s mom, who ends up being hospitalized for severe depression. And we have Wren’s eight-year-old brother who has Asperger’s. When Wren’s mother is hospitalized mental health reasons, Wren and her brother Russell end up staying with their Aunt Marianne and cousin, Silver, who is in the same grade as Wren. Aunt Marianne and Silver and new transplants to Pennsylvania from Florida. In Wren’s eyes Silver is fearless, takes risks, and is intimidating to Wren. When they’re assigned a school report, Silver decides to embark on a trip to a forbidden place for her assignment. Wren has to choose whether she can be fearless like her cousin or if her anxiety will ultimately continue to hold her back. This is an excellent book, it realistically highlight the struggles that families experience with children and parents with mental health issues. This review has been hidden because it contains spoilers. To view it, click here. I really liked this book. It was sweet and heartwarming. I loved all the characters in this book especially Silver and Aunt Marianne. And Wren was just a good sister to Russell and one of my favorite parts was when Wren and Russell were in the glider and the roles reversed, he started comforting her!!! That just made my heart melt! Overall this was a great read! I loved the message, I loved the beginning, middle, and end! Most of all I loved how Wren changed throughout and realized that being b I really liked this book. It was sweet and heartwarming. I loved all the characters in this book especially Silver and Aunt Marianne. And Wren was just a good sister to Russell and one of my favorite parts was when Wren and Russell were in the glider and the roles reversed, he started comforting her!!! That just made my heart melt! Overall this was a great read! I loved the message, I loved the beginning, middle, and end! Most of all I loved how Wren changed throughout and realized that being brave doesn't mean you can never be scared. An excellent book that provides a fresh moral not found in other books for children. Be brave. Overcome your fears. Maybe... you may only be afraid because of what others have said. The story is compelling and interesting. The metaphor used is clear and well thought out and means a lot. The plot twist and the ending is unpredictable - for kids at least - and explains everything, which really shows how well-written this book is. The characters are deep and conflicted and - of course - develop to b An excellent book that provides a fresh moral not found in other books for children. Be brave. Overcome your fears. Maybe... you may only be afraid because of what others have said. The story is compelling and interesting. The metaphor used is clear and well thought out and means a lot. The plot twist and the ending is unpredictable - for kids at least - and explains everything, which really shows how well-written this book is. The characters are deep and conflicted and - of course - develop to become more mature and braver than they were. Loved the symbolism and the simplicity of the story. It was beautiful yet so meaningful. Cecilia Galante is the author of several middle grade, young adult and adult novels. She also teaches 8th grade English at Wyoming Seminary Prep School, and teaches creative writing in the MFA program at Wilkes University.